Have you got a challenge for this year? As Spring approaches and days get longer, lots of us are planning longer rides and adventures on two wheels. For Jayne Edwards and Sam Dillon, the adventure started a year ago and hasn’t stopped. 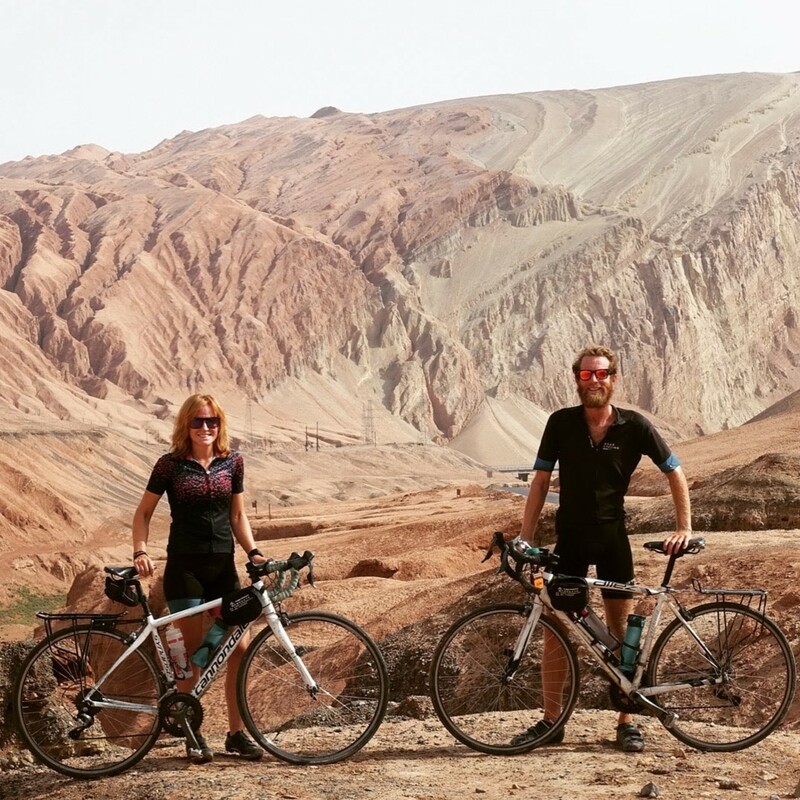 They decided to think bigger than their daily commute and see the world by bike. They plotted a route across five continents and set off last June. We caught up with them on a rest day to find out where the inspiration came from for their trip and the highlights so far. 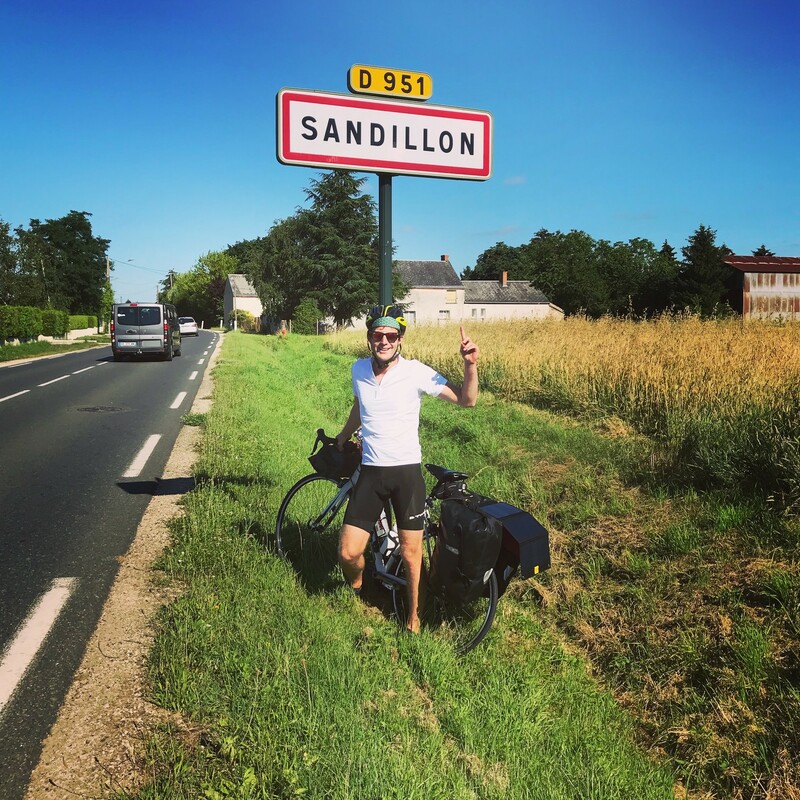 You're over eight months into your trip cycling around the world - where did the idea for this epic adventure originally come from? Jayne - I was at a hen do in Paris, talking about the Ironman I was training for and these girls started talking about their friend who did a crazy thing and cycled from London to Singapore and it sounded like so much fun. When I came home I asked Sam if he wanted to go cycling round the world and he said yes! I don’t think I have ever seen him so excited about anything else before. Were you both regular cyclists before or did you have to build up to long distances? Sam - We both commuted to work everyday. Jayne did long distances as part of her ironman training, but had never ridden with panniers on her bike before we left. I had done a couple of short cycle tours - cycling to Amsterdam and completing LEJOG (Lands End to John O’Groats) the year before. The best way to train for cycling is to cycle. We were both fairly fit before leaving and hoped that everyday on the bike, we would get a bit fitter and it would get easier. Your route has taken you around the world. What has been your favourite leg so far? Sam - I loved China. A complete contrast to what we're used to but the people were friendly and curious. Jayne - Mine has to be China too. But to be more specific, the cycle into Xian along the Weihe river. We were cycling with a friend we had met a few times along the road and the scenery was breathtaking. 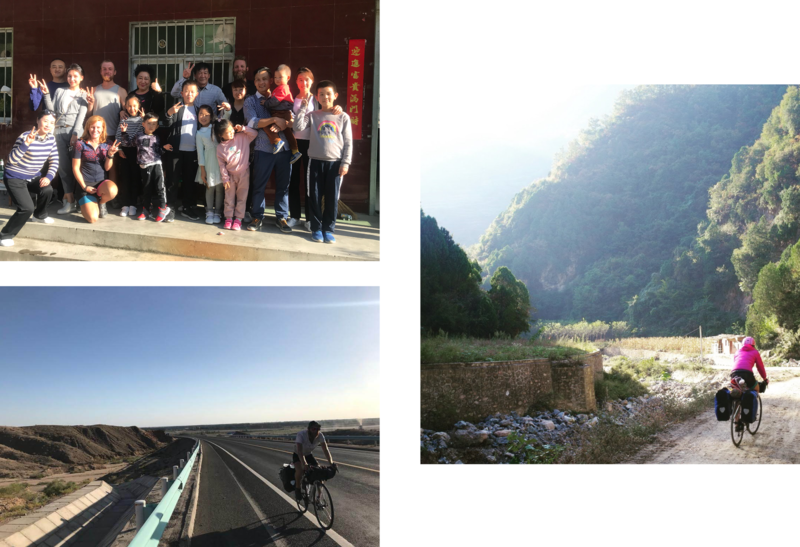 Beautiful gorges, old rickety bridges, green mountains on either side, and to top it off we were invited to a family BBQ where we were given more food than we could eat - the cycle tourist’s dream. ↑ Top: Meeting the locals. Right: Cycling along the Wei River. Bottom: Long, straight roads in Xianjing, China. Which has been the toughest location? Jayne - Our toughest location was the Pamir Highway. Our road bikes were not built for Tajikistan at all! Everyone we met commented on how they were an odd choice of bike for the roads we were on. One of my toughest days was when I got a puncture in both my tyres cycling up this hill on these rocky bumpy roads, but Sam had cycled off ahead of me so I had to walk two miles to catch him up. I was not in a good mood at the top. Sam - While the Pamir was tough, the wind in Australia can also be brutal. It was so flat yet one day we went from cycling 145km in 5 hours, to struggling to do 80km. We had run out of food and water so had to get to the next town, or else we definitely would have stopped earlier and called it a day. When we finally reached the town, Jayne went in to the local supermarket and came out with 3 bags of food and some beer. We remembered why we tried not to go food shopping when we were exhausted and hungry! 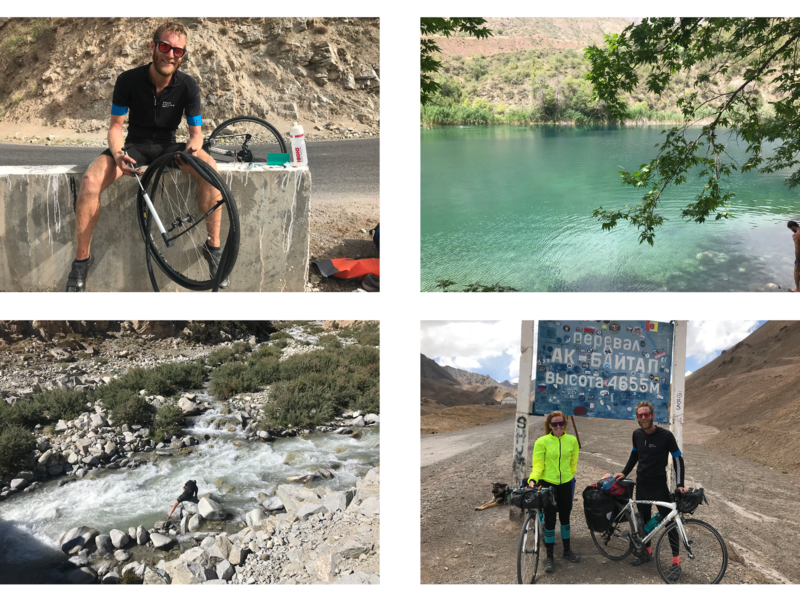 ↑ Scenes from Tajikistan: Bike maintenance at the side of the road; Beautiful lakes and rivers; Successfully reaching the top of Ak-Baital Pass on the border of Tajikistan and Kyrgystan. Where are you most looking forward to visiting? Sam - After the Terracotta Army (which did not disappoint, even on my second visit) I was most looking forward to the Redwoods in California, to see these trees that were thousands of years old and how they have stood the test of time (and logging). Jayne - I am really excited to visit the salt flats in Bolivia. They look so beautiful, like you are walking on water. 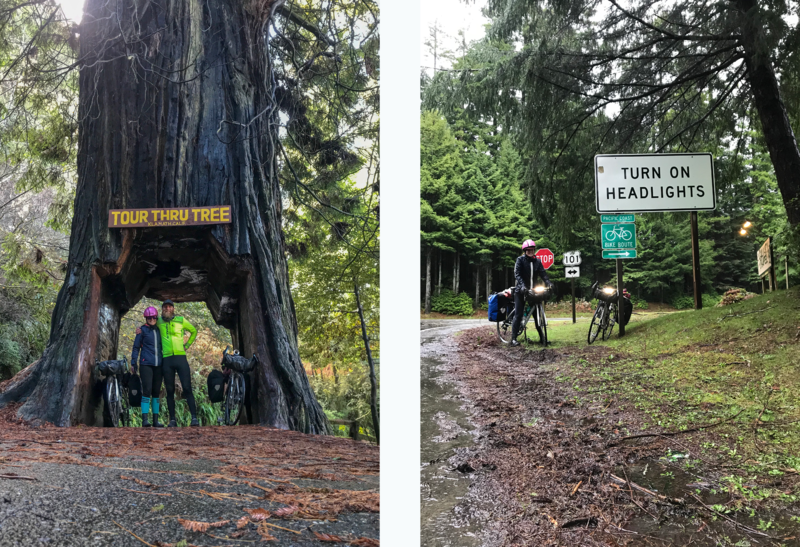 ↑ Left: A tree big enough to cycle through in California. Right: Beryl Front Burners on high beam through the forests of Oregon. With so many countries under your belts, you must have tried some incredibly varied food. How do you fuel your trip and what delicacies have you discovered along the way to give you energy? Jayne - Our food varies from country to country, depending on the price and availability of certain ingredients. It mainly consists of porridge and bananas for breakfast and then rice or pasta with a selection of local vegetables for dinner. We have two pans to cook with so we do try and make it as interesting as possible, but sometimes we have fried rice with carrots and peas one day, then carrot and pepper risotto the next day. We have also tried some interesting delicacies along the way. Some of the most memorable are: donuts by the Ak Baytal pass in Tajikistan; a random assortment of insects Sam ate in Kashgar; beef noodles in Xian; roast goose in Hong Kong; kangaroo burger in Australia; and Dungeness Crab in California. While our main meals have changed, so have our snacks. In Europe we ate lots of wafers, in Tajikistan snickers, China was all about the chocolate biscuits and in America, peanut butter sandwiches. Your bikes must take quite a bashing on the road. 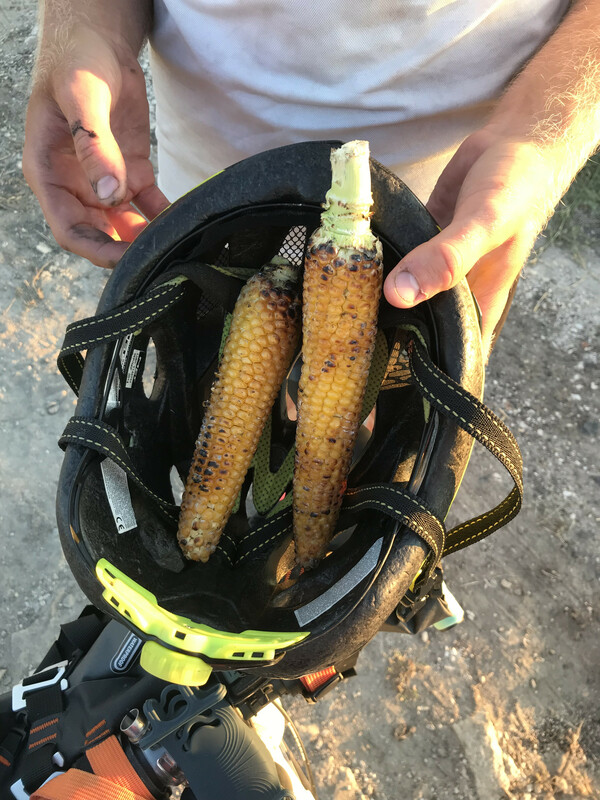 How do you keep them in top condition for riding? Sam: The key thing is to keep them clean. Once grit and mud starts to get in all the parts, they are more likely to go wrong. We have tools that we can use to maintain our bikes on the road and fix small things that go wrong such as a broken gear cable. For any big jobs - like a broken hub - we would need to go to a bike shop anyway. However, despite all the best intentions and maintenance, they still make funny noises. It’s about working out what is serious and what is cosmetic. At the end of every section, mainly before we fly we spend a day on bike maintenance. In America it was really helpful as lots of our warm shower hosts were also great bike mechanics so had lots of tools to help us. ↑ Bike punctures need to be fixed at the side of the road, while more in-depth maintenance can take place rest stops or at bike shops. What advice would you have for anyone who wanted to build up from cycling short distances for commuting or weekend rides to doing long distance routes over multiple days? Sam: Start small. Don’t plan a weekend with two 100 mile rides straight off. 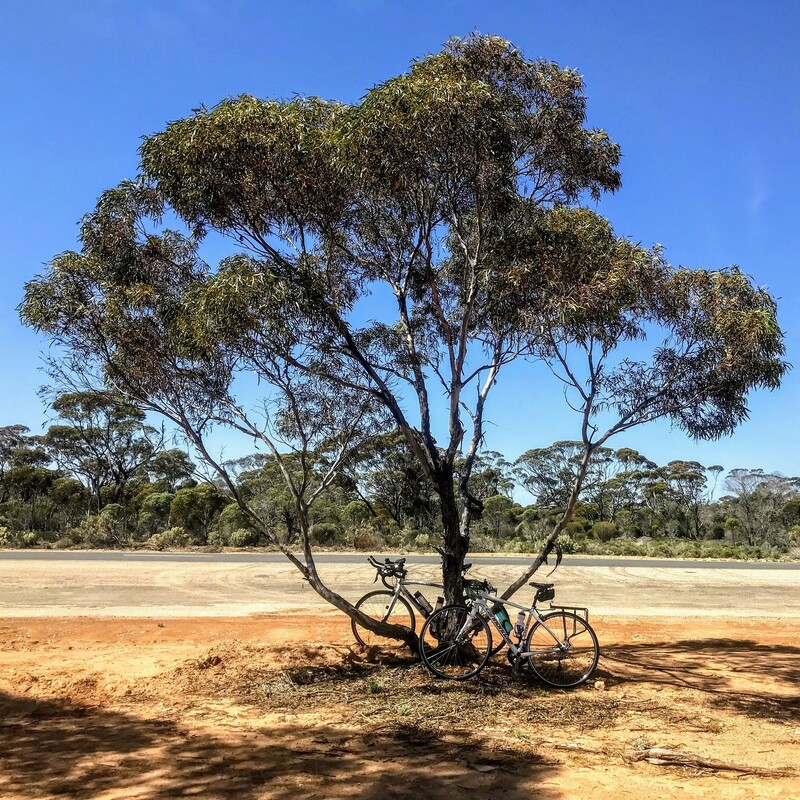 A good idea is to make the cycle part of a fun activity, for example plan a weekend trip to a specific campsite, pub or AirBnB and have that be an integral part of the trip. Before we set off, we would do long weekend rides to Bruges from London with friends. Don’t be afraid to add in trains to the journey if it helps you get where you want to go. When you start out cycle touring it’s probably not worth buying all the top of the range equipment: use what you have, borrow from friends or buy second hand on eBay. Once you do more cycling you’ll work out what you like and what you don’t. Everyone has a different set up and you’ll quickly work out what works for you. Jayne: A key piece of advice is to get comfortable with loaded panniers on the bike. They give the bike a different feel. The same is true when you take the panniers off - our bikes suddenly become so much more responsive. While it’s nice to ride unloaded, know that deep down all bikes want panniers attached to them. While we don’t plan too much anymore, for a first trip it would probably be worth knowing what roads you plan to take and including cycle routes. There are lots of resources online. Above all, remember that cycle touring it isn’t the same as doing a weekend ride. You shouldn’t have to eat snack bars on the move, you can take things at a more leisurely pace, plan in lunch halfway through and make the most of rest points and places to see along the way. Finally, have fun. Do distances that feel comfortable and that make the experience enjoyable as you build up to going further and further. ↑ Take breaks, have fun and enjoy the ride! Founder and CEO of Trakke, makers of the "Best Bike Messenger bag" in the world, talks to us about building a business for those who roam. Red Bull Timelaps isn’t a ride for the faint-hearted; it's the world's longest one-day road cycling event. Marketing at surf brand Finisterre, Oli Culcheth's life revolves around bikes, boards, books and beards. We talked to him about responsible businesses, cycling in summer and his other passions.